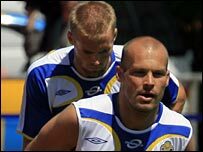 Swedish team-mates Fredrik Ljungberg and Olof Mellberg were involved in a dressing-room dispute after Saturday's draw against Trinidad & Tobago. A spokesman for the team admitted there was a "short but hot" altercation. Ljungberg explained: "We want to go far in this tournament - that's why we discussed it and hopefully we'll play better against Paraguay. "That was the whole point of the discussion. In lots of games there are discussions afterwards." The two players tussled in training before Sweden's opening match against England at the 2002 World Cup and had to be pulled apart by team-mates Daniel Andersson and Henrik Larsson. Ljungberg admitted he was not close to the Aston Villa defender, but denied there was any animosity between the duo. "I socialise more with other players than I socialise with Mellberg," the Arsenal midfielder said. "But I have all respect for him as a person and as a player. So there's no problem there." And coach Lars Lagerback said he was not concerned about the latest spat, which took place after the 0-0 draw with Trinidad and Tobago. "Sometimes it's like that after a game, especially if you don't get the result you want," Lagerback said. "There are lots of feelings after a match like that. If you win, most people are happy in the locker room." Sweden next play Paraguay in Berlin and England in Cologne on 20 June.